Sanibel Scrubs is our exclusive brand of medical scrubs and features two lines of everyday fashion solids to dress up your work wardrobe. 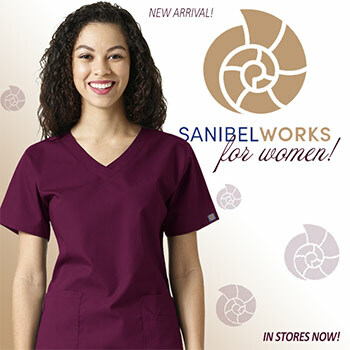 Sanibel Scrubs provide the comfort you desire with the fashion you are looking for. Our Sanibel or Sanibel Stretch line is just what you need for your workday with scrubs that look great and feel great. We’ve got both bases covered and give you the best quality at the best price. Our goal is to provide you with an outstanding selection of the best nursing uniforms and uniform scrubs on the market at reasonable prices. 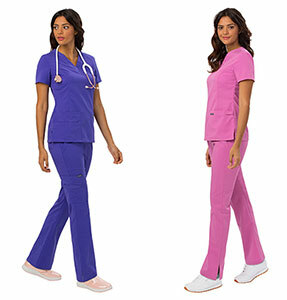 We are constantly updating our styles and inventory to provide you with exhilarating new lines of medical uniform scrubs with exciting new styles and colors. We take pride in our extensive, high quality line of Sanibel medical uniform scrubs and being a supplier to medical professionals across the United States. Whether you are a Doctor, Nurse, Dentist, or Child Care pro, Sanibel Scrubs has the right uniform scrubs to fulfill your requirements. Within our large inventory of top-quality Sanibel Scrubs you are certain to locate the uniform scrubs that will suit your needs. Scrubs are the sanitary uniform worn by physicians, surgeons, nurses and other professionals working in patient care at medical and day care facilities. Scrubs were first designed for people working in operating rooms such as surgeons and nurses who would wear them prior to scrubbing in for a surgical procedure, since they are conducive to a more sterile environment. Today they are worn by a variety of health care personnel. Scrubs are also worn in other work environments when clothing may contact infectious blood, body fluids, or organisms. They are frequently worn by veterinarians and people working in laboratories. Scrubs are designed to be relatively simple with few places that will harbor contaminants. They are easy to clean and inexpensive to replace should they be stained or irreparably damaged.